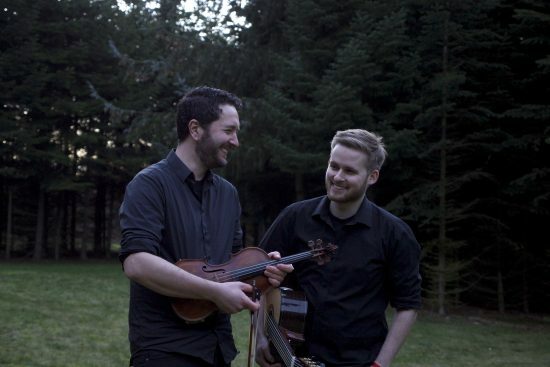 With a duo repertoire ranging from emotional soundscapes to intoxicating rhythmical pieces, violinist Bjarke Falgren and guitarist Sönke Meinen blend folk and jazz styles, classical music and basically everything else they can get their hands on! Denmark-based Bjarke Falgren tours all around the world and writes and produces music for film and theatre. German guitarist Sönke Meinen also performs solo and together with jazz guitarist Philipp Wiechert or jazz singer Anna-Lucia Rupp. He has won numerous prizes since his first stage appearances, and in 2016 he collected awards at two of the largest international guitar competitions: the well-respected „Guitar Masters“ (first prize) and the European Guitar Award (sponsoring prize). The Australian guitar wizard Tommy Emmanuel introduced Sönke Meinen to his audience as „one of the most creative guitarists in the scene today“. Falgren and Meinen coax a wide range of different timbres out of their instruments, from warm and tender to powerful and percussive. Their original compositions are sometimes extremely gentle and sometimes highly energetic, but an uplifting concert experience full of playfulness and emotional intensity is guaranteed!